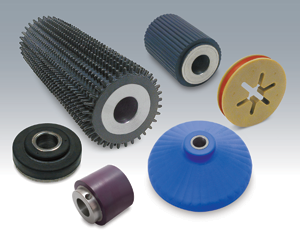 Custom Bonded Rubber-To-Metal and Rubber-To-Plastic Components For Medical Equipment, Pump and Impeller Components, Conveyor rollers and more. Prototype to high volume molding for rubber to metal bonding of components is a Rubber Industries specialty. These components are chemically bonded during the vulcanization and curing process to ensure permanent seal of the bonded components. With over 45 years experience, no one understands the relationship between rubber, metal and adhesives better than Rubber Industries. The company regularly custom designs assemblies from a full spectrum of elastomer materials and bonds them to a broad range of metals including stainless steel, medical grades of aluminum and plastic. We are experts in determining the ideal process that results in a bonded assembly with cost effective, high performance features that meet customer’s performance requirements. 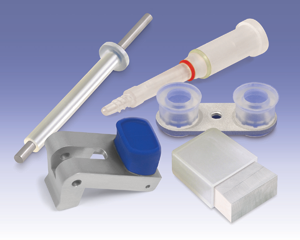 Rollers, seals, gaskets, handles and buttons for medical diagnostic equipment. Cleats, bumpers, rolls and wheels for heavy duty conveying applications including mining and large industrial applications. Pump impellers, diaphragms, bellows, seals and gaskets used for a wide range of heavy duty, fluid applications. High pressure, extreme temperature, and harsh environmental condition components. Rubber Industries offers a full range of custom formulated materials and hundreds of standard materials, to meet correct functional, environmental and color requirements of the bonded assembly. Virtually any application requirement can be met with this vast amount of formulations, including resistance to heat, cold and the harsh environmental conditions. Specific performance requirements such as hardness, fluid resistance, abrasion resistance, shrinkage, elongation, modulus and cost are addressed by Rubber Industries for specific rubber-to-metal bonding applications. 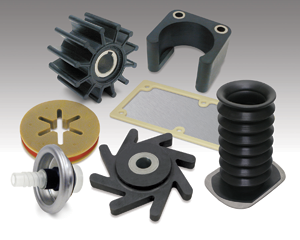 Rubber Industries provides these custom components with unique performance features in prototype through large volume quantities using injection, transfer, compression molding and LIM (Liquid Injection Molding) processes. Rubber Industries has complete in-house capabilities for turnkey rubber-to-metal bonding including: design assistance, tool design and building, production molding, deflashing, and packaging. All Rubber Industries processes are optimized for fast product turnaround.